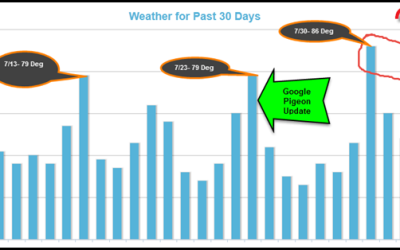 Google announced Authorship markup in Jun 2011 and almost after 3 years, it dropped it from SERP. Now why I’m discussing those old buried thing again? Well, after that incidence, many SEOs opined that authorship might not be an important factor in ranking. Now check the below screenshots taken on 4th & 5th April. 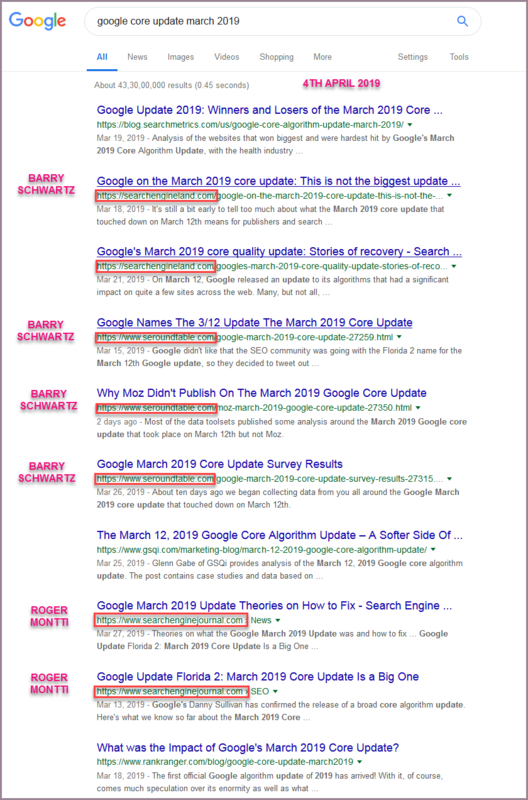 For the search query “Google core update March 2019” on 4th & 5th April, we can see that multiple pages of Search Engine Land, Search Engine Roundtable & Search Engine Journal are ranking in 1st page on both days and only 2-3 other sites are in 1st page of Google SERP. And interestingly, Barry Schwartz is the author of four blogposts of the above & Roger Montti is the author of 2-3 blogposts. 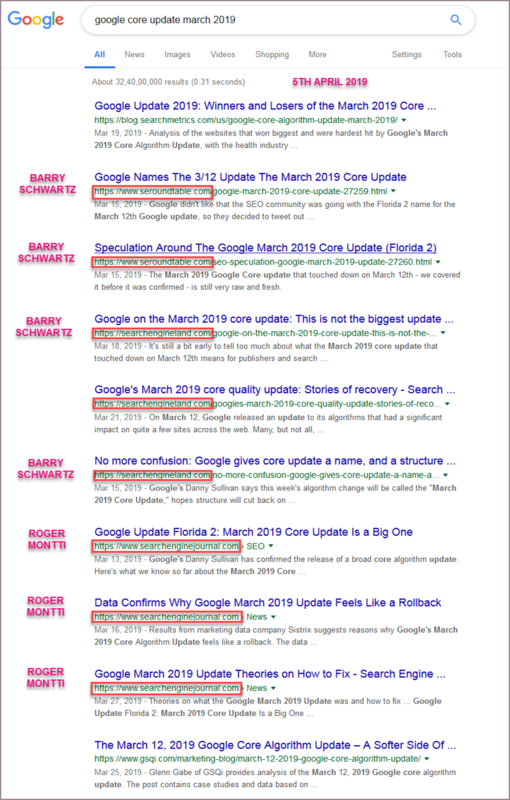 In general, for most queries, Google doesn’t show multiple pages from the same domain. But here we’re not only seeing the same domains but the same authors too. This made me rethink about the importance of E-A-T. And in this case, all such results are perfect combination of all three features; Expertise, Authoritativeness & Trustworthiness. Out of top 10 results, 7 results are from two authors only. Even you must admit that kind of results are pretty rare. In this case, we’re seeing two authors, Barry Schwartz & Roger Montti. Should I discuss about Barry? Whenever we come across any SEO news, either he is the source or we check his SER or his tweets to get confirmation. He himself is a brand in SEO news space. Roger Montti is like a legend in the SEO industry. He is the one you often encounter in discussions on Webmaster World. With valuable insights on topic ranging from links to content in that forum, he has shaped career of many SEOs like me. So, there is simply no doubt about their expertise. Whatever news or articles come from such guys, readers won’t give a second thought before accepting that as fact. So, I’m not surprised to see multiple articles from them in the 1st page of search. We’ve already discussed about the expertise level of both writers. When we see the sources or websites where the articles come from, we’re seeing three websites. These are like three pillar of SEO industry. 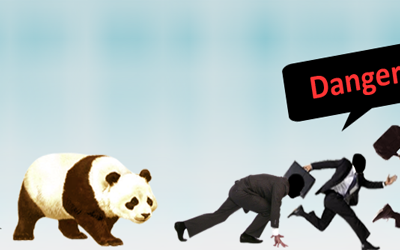 For any SEO news, or updates in Google search algorithm, SEOs simply look into these three sites. So, info coming from these sites are beyond doubt. Here if we consider from ranking perspective, articles written by Barry & Montti in sites like the above three are a perfect blend of Expertise, Authoritativeness & Trustworthiness. There is simply no competition here. 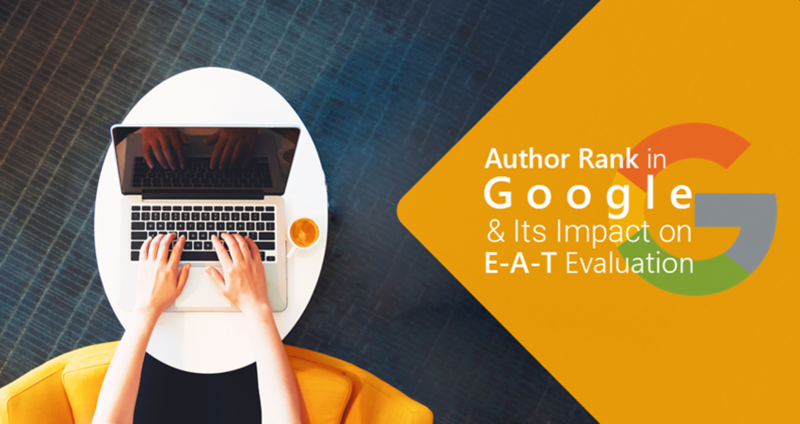 You may think E-A-T is a well-known fact in SEO industry, then why I’m discussing it here. Well, my intention is to show to what extent Google considers the importance of these three qualities in its search algorithm. And again remember to what extent Author Rank influences the ranking. Many SEOs once thought Google had lowered the importance level of Author Rank after it removed the pic, name & G+ link from search results. Though Google had stated different valid reasons but I think stopping spam might be another good reason. We come across news like how some authors knowingly boost their clients in different posts in high quality sites though there is no relevancy between the content and their clients’ business. Links to authors in search results would have prompted businesses to chase such authors. And going forward, we might have seen more spam in that space if Google had continued that feature in search. I think following things can affect your author rank. Author Rank can’t be developed in short period.